LIVE off the floor and BURNING! 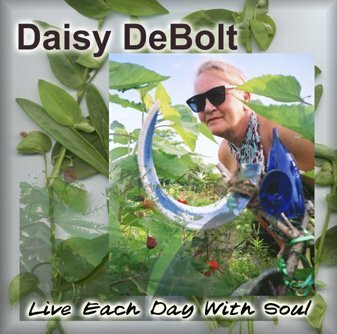 DAISY DeBOLT proudly releases her newest recording, a jazz album, " LIVE EACH DAY WITH SOUL", which is a heartfelt a tribute to her mother, Marjorie DeBolt, a well-known jazz musician from Winnipeg. The title comes from some motherly advice, and Daisy has definitely heeded her late Mother's words, with a performance that rocks, cries, soars, swings and gets downright blue. Songs of the soul from the heart with an edge -- pure DeBolt. Known and acclaimed for her folk singing, brilliant and poetic lyrics and powerful chops, Daisy fulfills a long time dream with "Live Each Day With Soul" -- to record a jazz album with Canada's top players and arrangers and sing with a horn section a block long backing her. The record features original compositions co-written with George Koller, Tony Quarrington and Michael Ondaatje, plus one standard, "Cry Me A River". Daisy and her producer, Tony Quarrington, have chosen Canada's most innovative musicians with Phil Dwyer as leader of the horn section consisting of Tom Skublics, Terry Lukiwski, and Daniel Lapp, monster keyboard/B3 player Doug Riley, bassist George Koller, Marty Cordrey on drums, accordion virtuosos Tiina Kiik and Bob Derkach, and guest appearances by Jane Bunnett, Roberto Occhipinti, Victor Bateman, Marg Stowe and Dave Restivo.